A regional editor who led the fight to save a city’s train-making industry after the government snubbed its bid for a £1.4bn contract has met the Prime Minister to discuss fresh concerns over regional aid. David Cameron took time out from his party’s local election launch in Derbyshire yesterday to visit the offices of the Derby Telegraph. After a tour of the newsroom, he sat down with Telegraph editor Steve Hall and senior colleagues to be grilled on his government’s plans for the city following last year’s decision to award the Thameslink contract to Siemens ahead of Derby-based Bombardier. Mr Cameron promised to look into why millions of pounds of regional growth fund and enterprise zone cash that has been promised to the city has been held up by red tape. The visit coincided with the launch of a new Telegraph campaign for the electrification of the Midland Main Line, which would cut journey times to London from Derby and other East Midlands towns and cities. 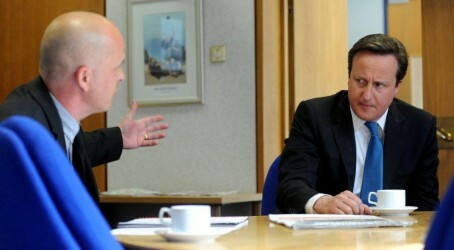 Mr Cameron was presented with a copy of the paper, which featured a front page editorial on the campaign, during the visit. Said Steve: “The Prime Minister clearly understands that the people of Derby feel burned by the Bombardier fiasco and, after promising to be a party for business, knows that he has a reputation to repair. “It is welcome that he has used his influence to secure orders for Rolls Royce that will be manufactured in the city. It is also positive that he has met with Bombardier’s owners. “He seemed to accept that Derby is a city that delivers and is a place where government investment will yield strong returns for UK plc. Mr Cameron had specifically asked to visit the Telegraph despite his government having been given a difficult time by the newspaper over Bombardier. He had been warned by the Tory city council leader in Derby that the saga was likely to cost votes and that many in the business community felt let down by the government. Although the Telegraph’s bid to overturn the Crossrail decision was unsuccessful, it has since resulted in rule changes which will give UK firms a better chance of winning government contracts in future. As a result, Bombardier has agreed to retain a design and manufacturing base in Derby, preserving 1,600 jobs. The newspaper’s Midland Main Line campaign has already been mentioned in Parliament after MPs secured an adjournment debate on the issue yesterday.